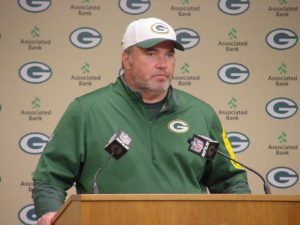 Green Bay Packers head coach Mike McCarthy said he will join his players and lock arms during the National Anthem on Thursday night. The Packers plan to demonstrate unity. The players released a statement through the team website Tuesday night inviting fans to join them in portraying unity, locking arms in the stands during the national anthem. Quarterback Aaron Rodgers revealed the invitation for fans to stand and lock arms in the stands on Tuesday, joining the players on a “united front”. The idea was discussed by the players in a meeting on Monday.